2nd Russian Olympian Fails A Doping Test At Pyeongchang Winter Olympics : The Torch Nadezhda Sergeeva, a bobsled athlete, failed a drug test for a banned heart drug, the Russian Bobsled Federation announced on Friday. Bobsledder Nadezhda Sergeeva, right, is the second Russian athlete to fail a doping test at the Pyeongchang Winter Olympics. She's seen here with her teammate, Anastasia Kocherzhova. A second Russian athlete has failed a doping test at the Pyeongchang Winter Olympics. Nadezhda Sergeeva, a bobsled athlete, failed a drug test for a banned heart drug, the Russian Bobsled Federation announced on Friday. Sergeeva failed a test on Feb. 18, the federation said on its Facebook page. It adds, "A few days before that, on Feb. 13, her sample was clean." The federation says that the bobsledder does not have a prescription for the drug. 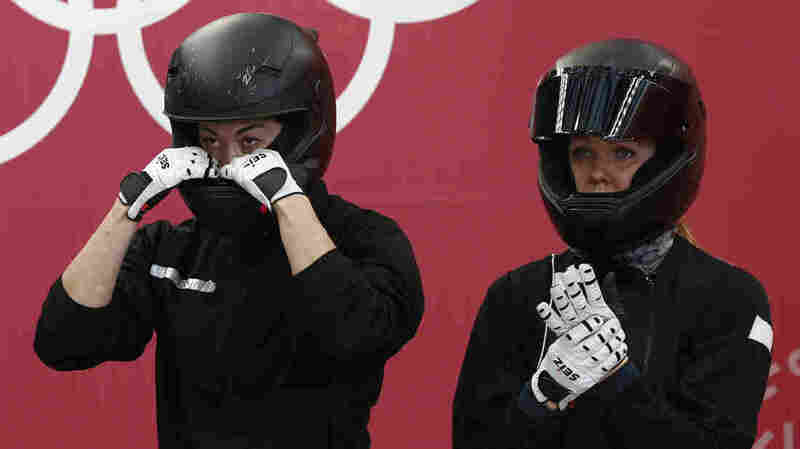 Sergeeva, 30, placed 12th in the two-woman bobsled competition this past Saturday. She was less than half a second from a podium time. The news about Sergeeva comes one day after a bronze medal was stripped from Russian curling athlete Aleksandr Krushelnitckii, who had tested positive for meldonium in Pyeongchang. Russian sports media are reporting that Sergeeva had trimetazidine in her system, citing a statement from the spokesman for the Olympic Athletes from Russia team. The drug was banned by WADA (the World Anti-Doping Agency) in 2014. Before the news broke about Sergeeva, Friday was setting up to be a great day for Russian sports fans: The first gold medal for a Russia athlete had gone to figure skater Alina Zagitova, and the men's hockey team had played its way into Sunday's final. But then came news that for the second time, a member of the 168-strong Olympic Athletes from Russia team had darkened the cloud that hangs over the country's Olympians. Shortly after word spread about Sergeeva, Zagitova stood on the top step of the podium in the medals plaza near the Pyeongchang Olympic Stadium and watched as the Olympic flag was raised in honor of her gold medal, rather than the Russian flag. As another part of the sanctions on her country, the Olympic anthem played rather than Russia's anthem. The two failed drug tests come after officials with the International Olympic Committee sought to provide assurances that the athletes from Russia had passed tight scrutiny and would continue to be tested in South Korea.